En Grecia hallaron un palacio con más de 3500 años de antigüedad, expertos aseguran que perteneció a al rey guerrero Ayax, que según la obra la Ilíada de Homero fue uno de los combatientes más famosos de la guerra de Troya. Las ruinas fueron descubiertas en la pequeña isla griega de Salamina, este hecho sirve de evidencia de que los mitos relatados por el escritor Homero en sus libros se basan en hechos históricos. El palacio habría sido de de 750 m2, el cual habría tenido cuatro pisos de altura y más de 30 salones. 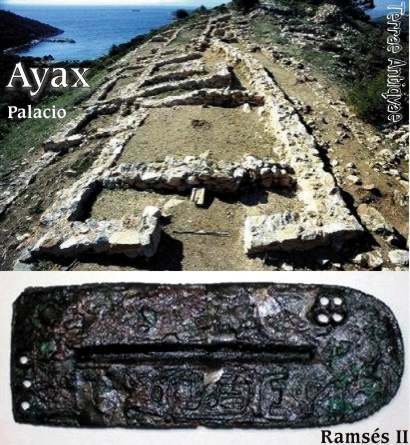 Yannos Lolos, arqueólogo que hizo el hallazgo, aseguró que la construcción era el hogar de una famosa dinastía de reyes que incluía a Telamón, rey de Salamina, padre de Ayax. Luego de la guerra de Troya en 1180 a.C., el palacio fue abandonado. En conclusión, creen que Ayax fue el último monarca en habitar el lugar antes de inicia la legendaria campaña bélica de 10 años. Este es uno de los pocos casos en el que un palacio de la era micena puede ser atribuido casi con certeza a un héroe de Homero, añadió Lolos. ATHENS, Greece --Among the ruins of a 3,200-year-old palace near Athens, researchers are piecing together the story of legendary Greek warrior-king Ajax, hero of the Trojan War. Yiannis Lolos found remains of the palace while hiking on the island of Salamis in 1999, and has led excavations there for the past six years. Now, hes confident hes found the site where Ajax ruled, which has also provided evidence to support a theory that residents of the Mycenean island kingdom fled to Cyprus after the kings death. "This was Ajax capital," excavation leader Lolos, professor of archaeology at Ioannina University, told The Associated Press on Wednesday. "It was the seat of the maritime kingdom of Salamis -- small compared to other Mycenaean kingdoms -- that was involved in trade, warfare and piracy in the eastern Mediterranean." Ajax was one of the top fighters in the legendary Greek army that besieged Troy to win back the abducted queen of Sparta, Helen. Described in Homers Iliad as a towering hero protected by a huge shield, Ajax killed himself after a quarrel with other Greek leaders. On a wooded hill overlooking the sea at Kanakia on Salamis southwestern coast, Lolos team has excavated a town surmounted by a fortified palace complex. The site flourished in the 13th century B.C. -- at the same time as the major centers of Mycenae and Pylos in southern Greece -- and was abandoned during widespread unrest about 100 years later. Scholars have long suspected a core of historical truth in the story of Troy, and archaeological evidence from the Kanakia dig appears to agree. Lolos also believes that, faced by an external threat, part of Salamis population left for Cyprus, founding a new town named after their homeland. "There is no other explanation for the creation on Cyprus of a city named Salamis," he said. "We established that there was a population exodus from Salamis, which was completely abandoned shortly after 1200 B.C. ... They must first have gone to Enkomi on Cyprus, which was already an established center." Salamis was founded around 1100 B.C., when Enkomi -- some 2.5 miles away -- was abandoned. "It was probably the refugees children that moved there," Lolos said. The emigration theory would explain why almost no high-value artifacts were found at the Greek site, which bore no signs of destruction or enemy occupation. "The emigrants, who would have been the citys ruling class, took a lot with them, including nearly all the valuables," Lolos said. The rest of the population moved to a new settlement further inland that offered better protection from seaborne raids. Kanakia, was first inhabited around 3000 B.C. The Mycenaean settlement covers some 12.5 acres, and features houses, workshops and storage areas. So far, archaeologists have uncovered 33 rooms in the 8,000-square-foot palace, including two central royal residences containing what appear to be two bench-like beds. "This recalls a reference by Homer to the king of Pylos sleeping at the back of his house," Lolos said. Finds include pottery, stone tools, a sealstone and copper implements. Lolos is particularly pleased with a piece of a copper mail shirt stamped with the name of Pharaoh Ramses II, who ruled Egypt from 1279-1213 B.C. "This is a unique find, which may have belonged to a Mycenaean mercenary soldier serving with the Egyptians," he said. "It could have been a souvenir, a mark of honor or even some kind of a medal." Excavations will continue in September, while future targets include the settlements cemetery, which Lolos has located nearby. Situated just off the coast of Athens, Salamis is best known for the naval battle in 480 B.C., when the Athenians defeated an invading Persian fleet. The ancient playwright Euripides was born there, and a cave excavated by Lolos in 1997 has been identified as a hideout where the poet composed his work. Troya es uno de mis temas favoritos al margen de los romanos. De hecho el Bronce Final (c. 1600-1200 a.e.v.) es uno de los períodos históricos que más me atraen. La \"guerra de Troya\" es un episodio, marginal, del final de un período en el que tienen mucho que ver las \"invasiones\" de los llamados \"Pueblos del Mar\" (¿existieron? ), la desaparición del imperio hitita, el declive de los reinos \"micénicos\" en Grecia, el establecimieno de los filisteos en Canáan, el debilitamiento de Egipto (el único gran estado del Bronce Final que sobrevivió en cierto modo a la debacle del 1200 a.e.v. ), etc. Todos ellos son aspectos de una época fascinante, cada vez más conocida gracias a las excavaciones y las interpretaciones de los datos aportados en las últimas décadas. Aunque esta visión también tiene sus detractores, que creen que las interpretaciones de Korfmann y su grupo son demasiado fantasiosas. A mí particularmente me seducen. Pero también hay más bibliografía al respecto y conviene tener en cuenta que la cuestión troyana es un asunto casi marginal en el momento de la debacle del período del Bronce Final en el Próximo Oriente asiático. Aunque no deja de estar relacionado: ¿destruyeron Troya los mismos, o estaban entre el grupo, que asolaron el imperio Hitita, destruyeron Ugarit y arrasaron el Levante, amen de poner contra las cuerdas al Egipto de Ramsés III? ¿Qué pasó con el mundo egeo de los palacios micénicos? ¿Qué hubo realmente en los llamados \"Pueblos del Mar\"?